We arrived in Melaka (also spelled Malacca) after a morning bus ride from Singapore, which involved getting off the bus at the border in Singapore, then getting back on the bus to ride across the causeway and then getting off again at the Malaysian border and back on until we got to Johor Bahru. At Johor Bahru, also called JB, we had a couple of hours wait to catch a different bus to Melaka. It sounds complicated, but it was pretty straightforward. It was kind of a pain trucking up and down the stairs with our heavy backpacks at both immigration stops. And we ended up hopping on a different bus than we started on at the first stop because we were confused about where to wait to get back on. Luckily it didn’t matter and we just got on the next bus from the same company that came through about five minutes later. We could have taken one bus all the way to Melaka, but changing buses in JB saved us US$10 a piece, which makes a big difference when you are multiplying everything by five. It wasn’t a bad wait. We hung out in the air conditioned Dunkin Doughnuts, feeling a bit guilty about eating in front of the Muslims on their first day of Ramadan. I also tried out one of those coin operated scales and discovered that, assuming the scale is accurate, I have lost 4 pounds already – yeah for Asian food and lots of walking! 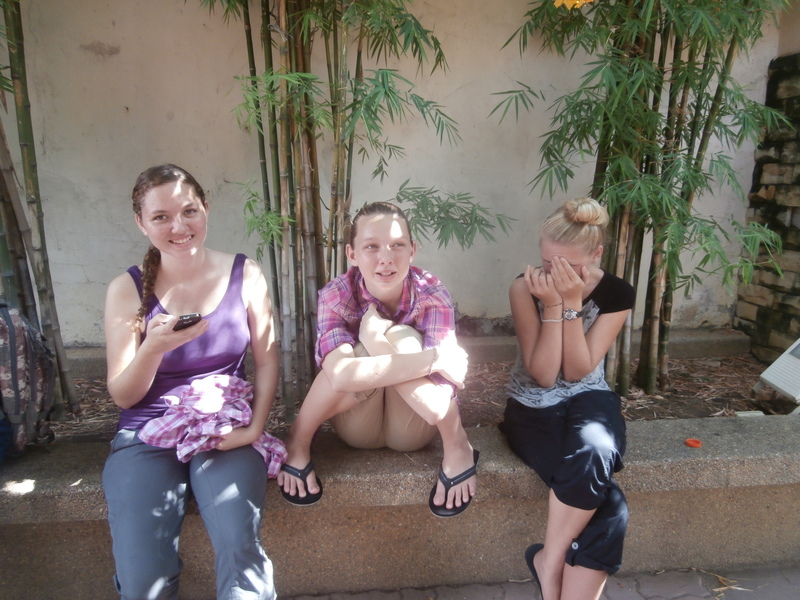 It was about 2pm when we got to Melaka. Thanks to google maps we were able to figure which bus would take us closest to our guesthouse. It saved us a few bucks over taking a taxi, a savings we wondered whether was worth it as we trudged the several blocks from the bus stop in the blazing afternoon heat with our packs. The owner/manager of Old Town Guesthouse was waiting at the door for us. He led us into his brightly painted guesthouse and had us sit down at the table in the common room for a brief orientation. He gave us maps and asked us about our plans. He was so friendly and helpful the whole time we were there. We had planned to eat at the well-known Capitol Satay while in Melaka and he suggested that we go that afternoon, getting there at 3:30 pm to be in the first group to get in when they opened at 4. We took his suggestion and headed out after resting in the room for an hour. Our adorable room in Old Town Guesthouse. We were in the “Beijing Room”. As I walked down the street from the guesthouse, I realized that I was back in the Southeast Asia that I remembered from our trip three years ago when I was hit by five consecutive, different but equally horrible smells. The air shifted to a scent of incense just as we arrived in the old town square. Thanks to helpful owner, we made it into Capitol Satay in the first round of guests. The girls waited at the table as Rand and I chose skewers of meat and vegetables to bring back to the table. In the center of the table was a pot of hot, bubbling sauce to cook the items in. We had only gotten one skewer of each of our choices, which usually had two or three pieces on it, making it hard to share five ways. When I went back to get more, I got three skewers of each choice, so each person could have one piece of each with one left over. Unfortunately in my effort to get different items from our first round, I came back with way too much of the not so good stuff. Make a note: fish balls are gross! Also, meat satay is better than tofu. Sorry vegetarians, but you are missing out. 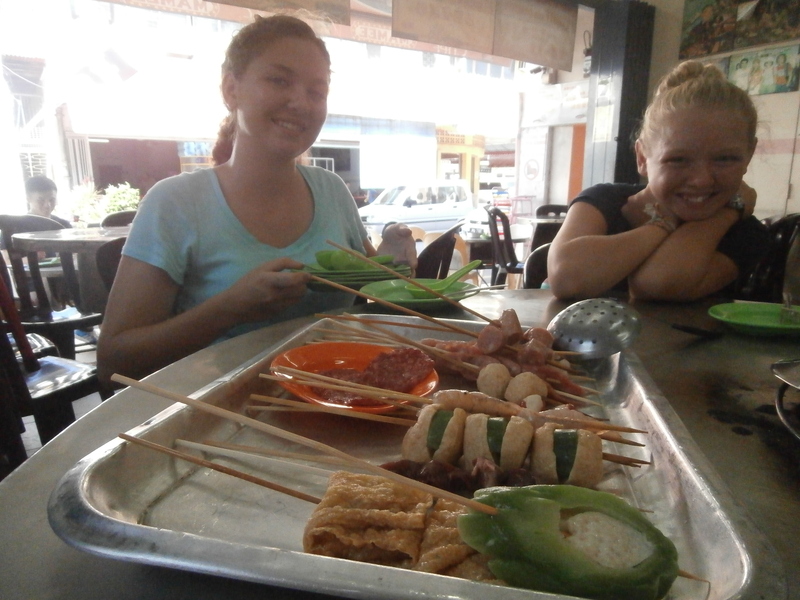 Sierra and Kali getting ready to enjoy Capitol Satay. See those white round things. Those are fish balls. They are yucky. 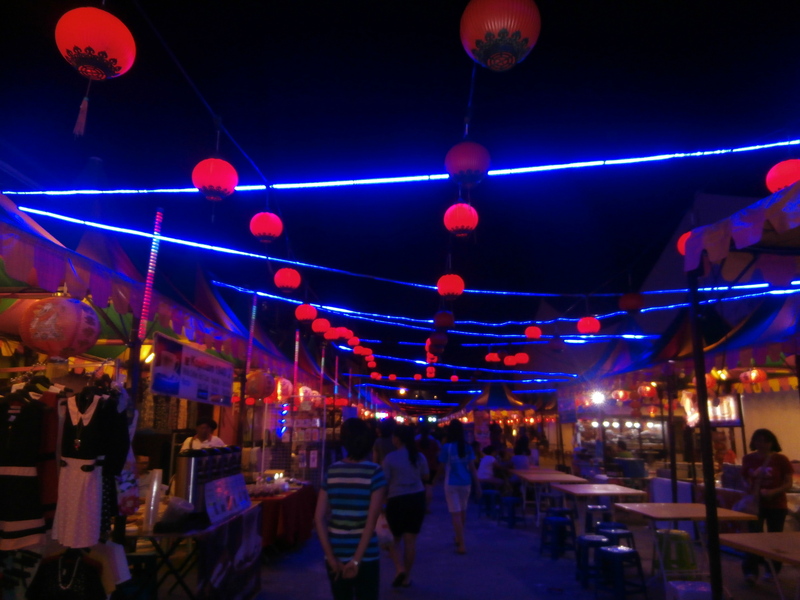 That evening we went to the Jonker Street Night Market. Since we were stuffed from the late lunch and my overzealous skewer choosing, we weren’t very hungry. It was an OK market. We snacked on pineapple tarts, sausages, some kind of pancake thing with chocolate in the center, and popsicles. The girls and I got scarves, which have come in handy on cold buses. I stood with Arwen for a minute and noticing her pupils dilating trying figure out why both girls suddenly fell ill at the same moment. I got Arwen outside and a restaurant patron told us that there was pharmacy two door down. I still wasn’t sure what to get at the pharmacy to help them. By this time, Rand came out with the food and realized they both were overheating. We got them some water just as Sierra noticed Arwen’s face and lips turning pale. I got them some rehydration salts at the pharmacy and we found a shady spot outside to eat the laksa. The girls recovered quickly. We got some of the same popsicles that we had gotten at the market the previous night and a coconut shake to keep everyone cool. Then we took it easy until evening. That night we walked along the river and had dinner in a Muslim area. We wanted to observe the breaking of the Ramadan fast. We watched as the everyone ordered their food and then sat it in front of them on the table, waiting until the evening call to prayer to break their fast. Although we did not fast, we decided to also order food and wait to eat until the evening call to prayer. We got Indian food that was fantastic, tandoori chicken, fried chicken, roti and sauces, and curry with rice. We also were handed a plate of dates which I found out later are what is traditionally eaten first to break the fast. Not knowing the tradition, I ate them at the end of the meal, oops. 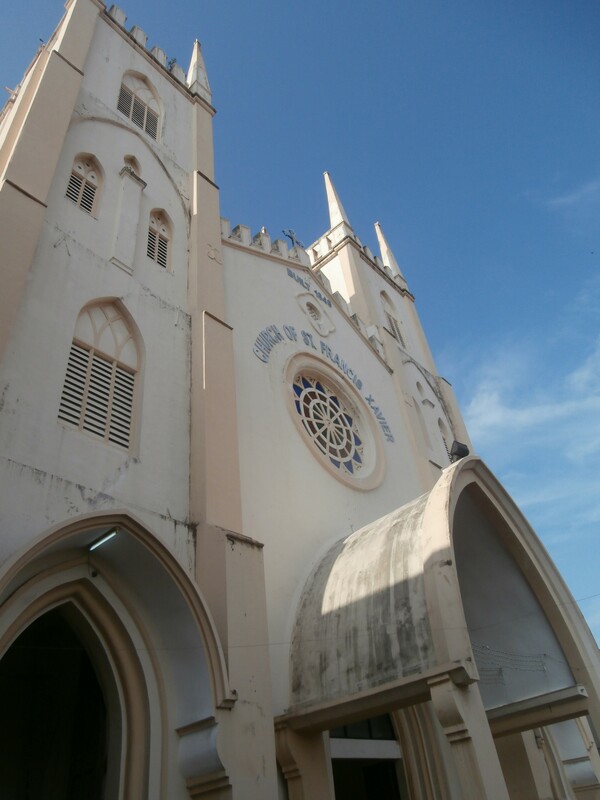 With the girls recovered, we spent the next morning visiting St. Francis Xavier Church, Christ Church, Cheng Hoon Teng Buddhist temple and Kampung Kling Mosque in the old town area. It is so interesting to be in a place with so many different religious traditions. For breakfast, I convinced everyone that we had to try durian puffs, a pastry with durian flavored cream inside. There were stands selling them everywhere. If you don’t know durian is a terrible smelling fruit found in Asia. They all took one bite and gave me back the rest. We have had durian candy and now durian puffs, but not durian fruit. So far we are not fans. 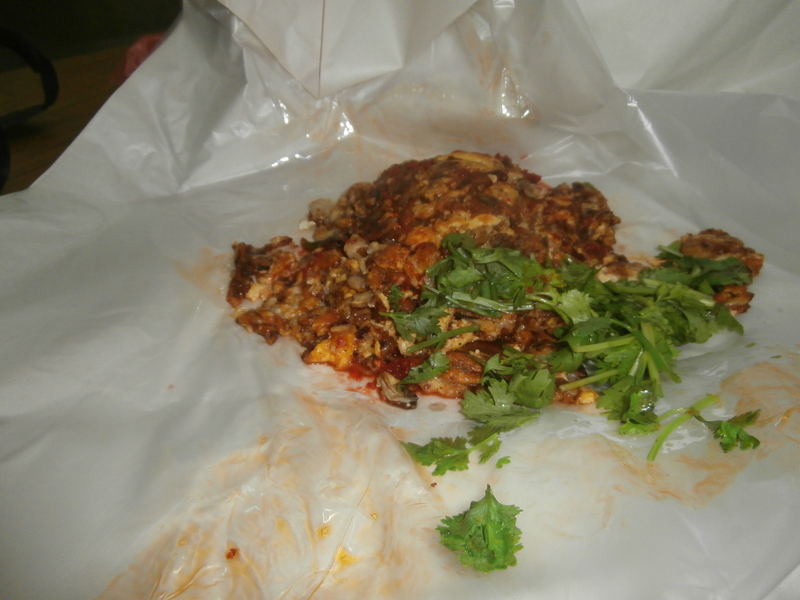 For lunch we had Indian food, biriyani and various sauces served on banana leaf that we ate with our hands. 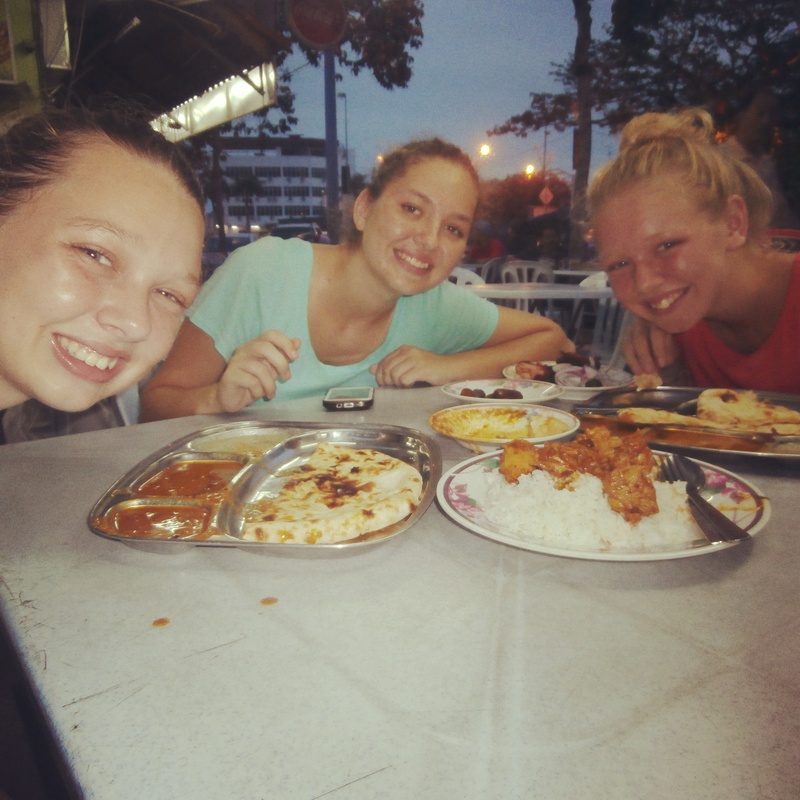 It wasn’t as good as the previous night’s Indian food, but still pretty good and cost us about US$3. 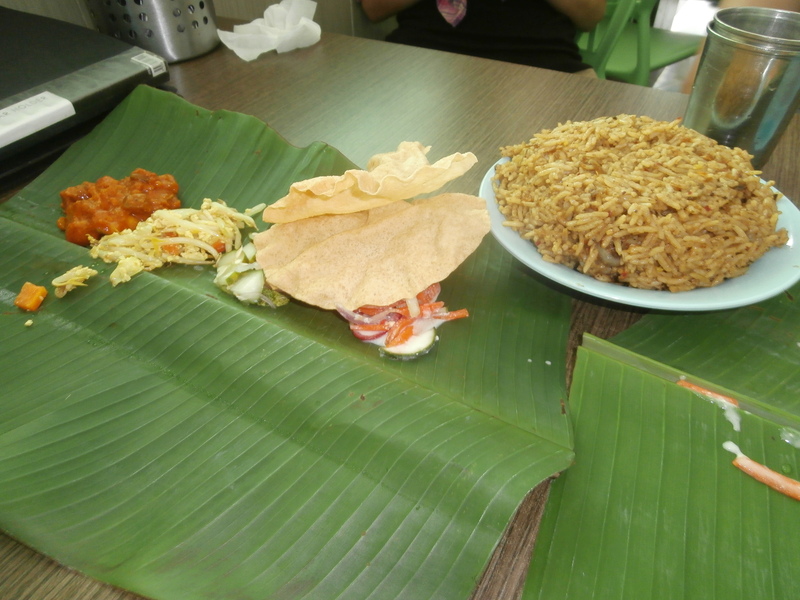 My Indian friend Steffi says that food tastes better eaten off of a banana leaf with your hands. After this lunch I have to agree with her. 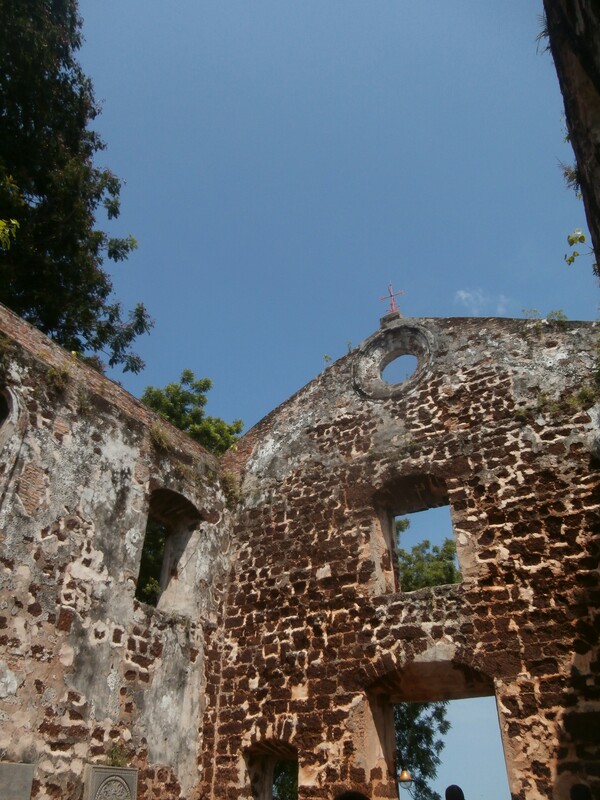 Then we headed up a hill to the ruins of the St. Paul’s Church and a Portuguese fort. From the top we could see a mall and decided to head down and enjoy some much need air conditioning. My phone said the real feel was 43C (110F) and we had sweat dripping down our backs to prove it. We thought about seeing a movie, but none of the theaters in Malaysia are showing Inside Out. It is a tragedy, I tell you. Hopefully, we will get to see it in Bangkok. Chiles cooked on a hot wok in an enclosed space is kind of like getting pepper sprayed. For dinner, we found an out of the way place that Rand learned about online. There were food stalls in kind of like a concrete garage that was open on both sides. Despite the fans, it was HOT inside. Also, it was full of smoke from the cooking woks, which caused everyone to start coughing every time a chili was added. So that was fun. The oyster omelet we got there was good, but we high-tailed it out of there as soon as we were done eating. That night we took the “river cruise”. We usually don’t do this type of touristy thing, but we like boat rides. It cost around US$25, which is a lot on our $100/day budget. It wasn’t a great boat ride. 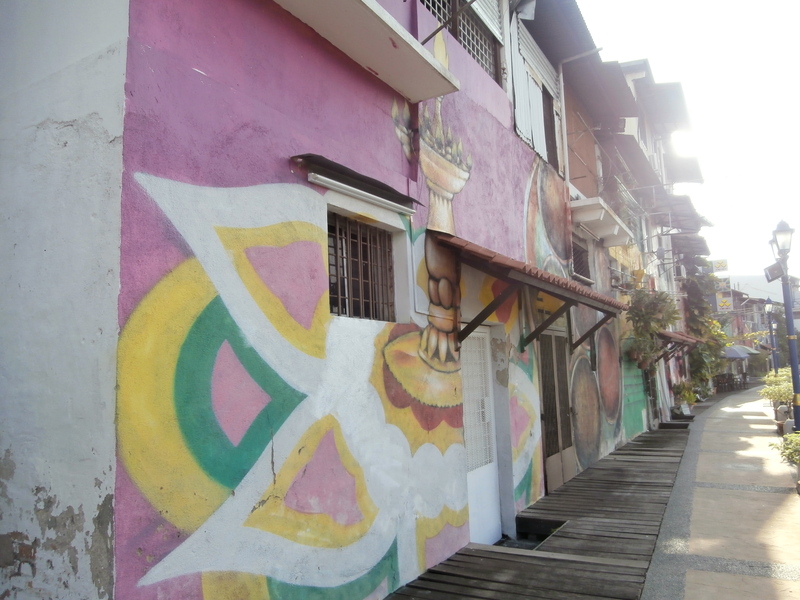 Once you get past the cute, painted old town area, there is not much to see. And we had already walked along river in the old town area several times. They do give you juice and cookies, but the juice was winter melon, which I think, based on the picture on the box and the taste, is zucchini. Zucchini juice – bleck! 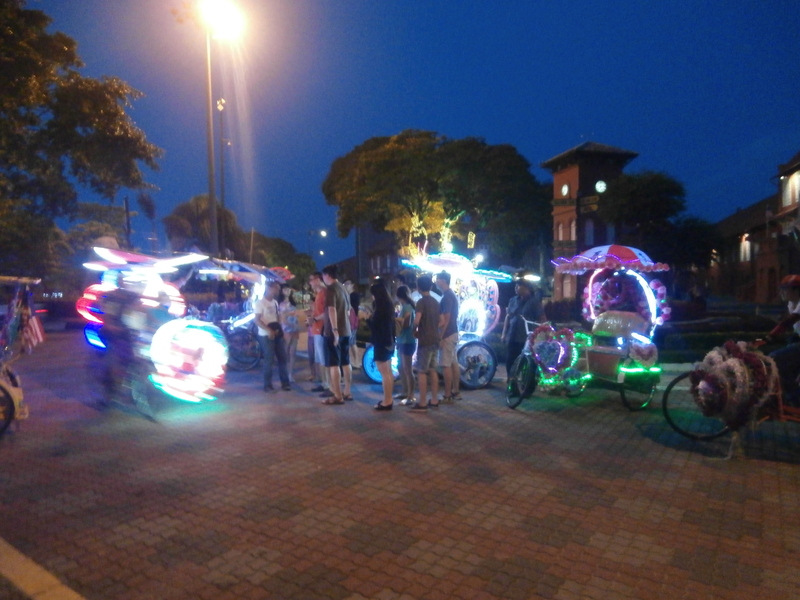 If I had it to do over again and we wanted to do something touristy, I would I have taken a ride on the colorful, brightly lit trishaws with the blaring music instead. 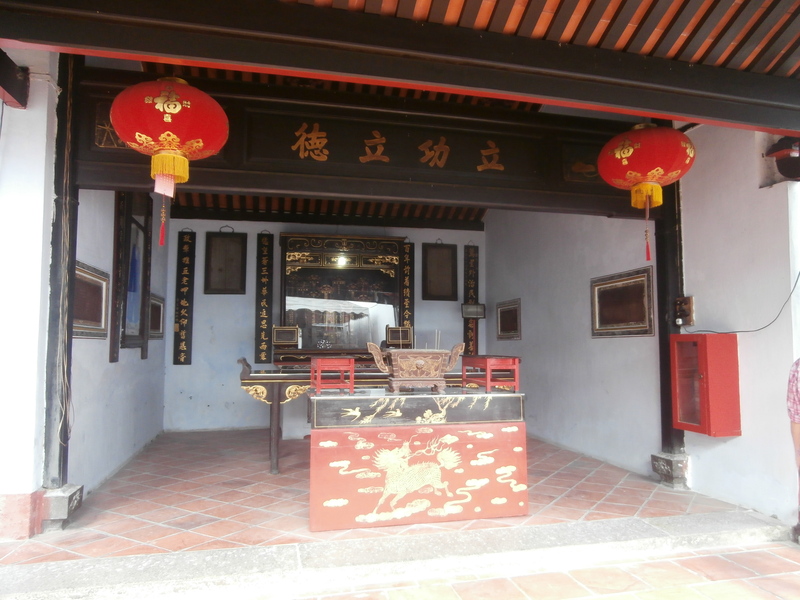 It was easy to stay in and even under budget in Melaka. Our room cost RM145 (about US$40). Our only sightseeing expense was the boat ride (about US$25). And food cost at most US$15 per meal. I think we ended up spending around $250 total for our 3 days there. 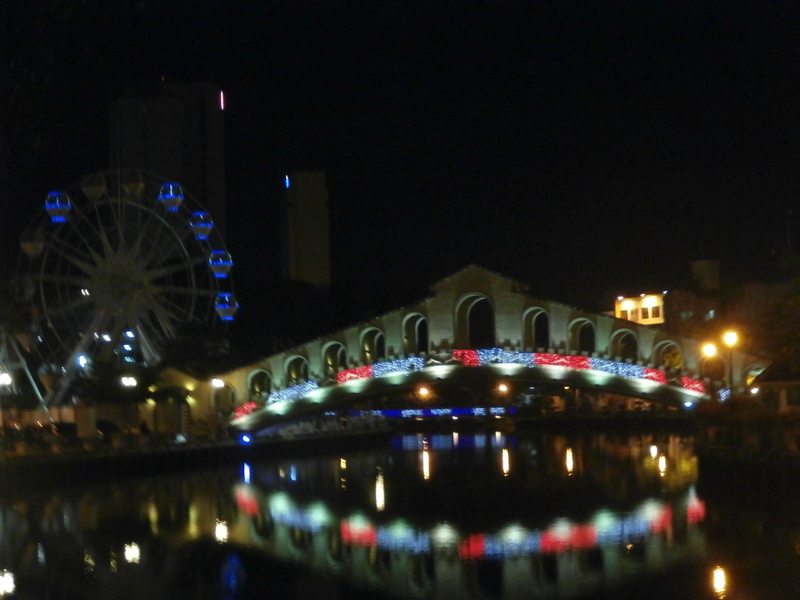 Despite the overheating, the horrible smells, and the boring boat ride, we enjoyed our time in Melaka. It was a lovely town to wander around and take in the sights while building up an appetite for the delicious Malaysian and Indian food. 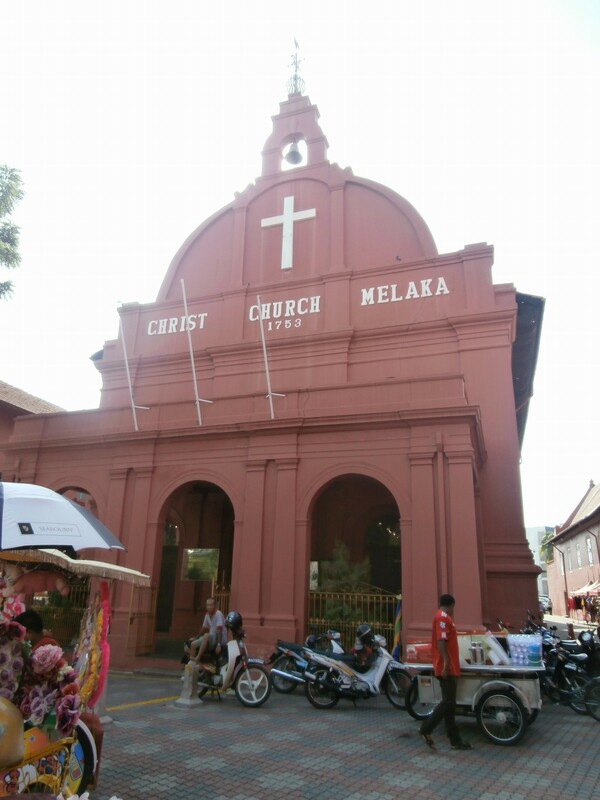 The weather in Melaka sounds like Florida in the summer without the air conditioning. I LOVE my air conditioning. 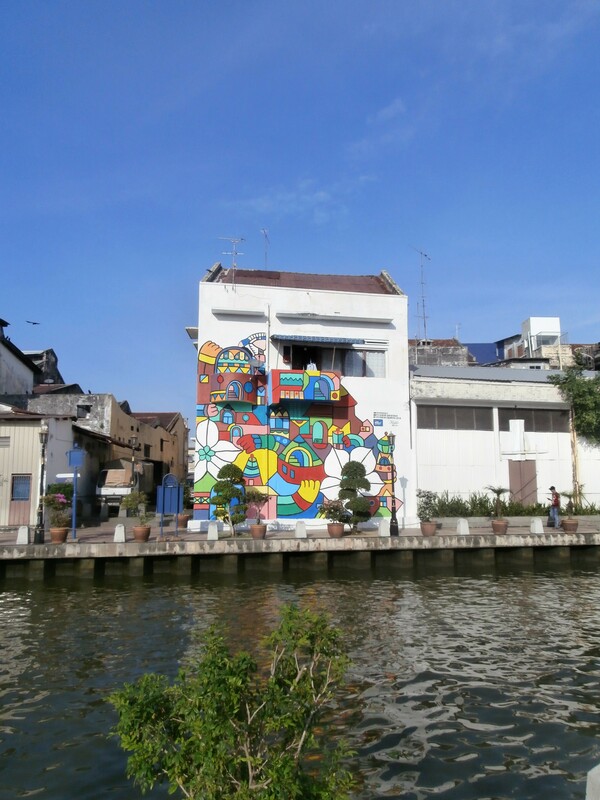 The pictures of the painted buildings are amazing and I am enjoying following your family’s adventures. We are so enjoying your travels and appreciate you letting us tag along! Love ya!